More than 150 orthodontists from 25 countries around the world recently gathered for a conference of lectures, workshops, networking events and a poster symposium. Representing 5 different continents, 13 experts in lingual treatment presented the versatility and clinical quality achieved with the Incognito System. A fully-customized, invisible fixed orthodontic appliance system, the Incognito System features robot-bent archwires and low-profile appliances that deliver efficient and effective treatment outcomes and are designed to optimize patient comfort. “The 2017 Incognito System Users Meeting demonstrated again the accuracy and state-of-the-art physiological outcomes using the Incognito lingual appliance in daily routine practices. These innovations support doctors worldwide, with highly esthetic treatment solutions that are easy to integrate,” says Esfandiar Modjahedpour, M.Sc.L.O., Germany. 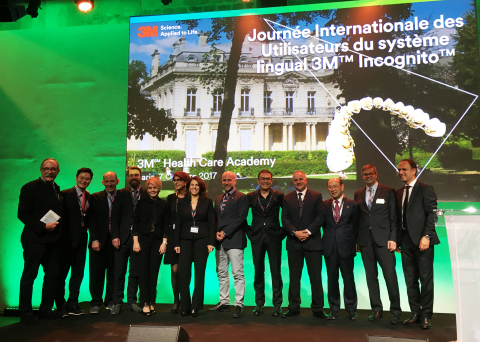 For nearly ten years, 3M has hosted such successful international lingual treatment user meetings to encourage educational activities about theoretical applications, and to share practical technique recommendations that can help make the system work well in the practice. This year, the Incognito System team also shared scientific research in the poster symposium, plus clinical advice services and practice marketing opportunities. The open exchange showcased treatment strategies using the latest system innovations, including the proprietary Clear Precision Tray, designed for accurate bracket placement and reduced bond failure rate, and a new bracket designed for improved angulation control. “Another amazing conference is in the books, for what is arguably the epitome of orthodontic art, science and skill—along with the most amazing group of clinicians, who work hard to give our patients the best choices,” says Adam Schulhof, DMD, USA. Since its introduction in 2009, more than 140,000 patients have been treated successfully with the 3M Incognito Appliance System. Well-known for excellent rotation, angulation, and torque control, the Incognito System sets the standard for esthetic, comfortable and individually customized orthodontic options. To learn more or order products, visit www.3m.com/Incognito. 3M Oral Care promotes lifelong oral wellness through inventive solutions that help oral care professionals achieve greater clinical, professional and personal success. Learn more at 3M.com/dental (dental) or 3M.com/ortho (orthodontics). 3M and Incognito are trademarks of 3M or 3M Deutschland GmbH. Used under license in Canada. © 3M 2017. Doctors quoted receive compensation from 3M. All rights reserved.